Abstract. Continuum manipulators are widely used in minimally invasive surgical robot systems (MISRS) because of their flexibility and compliance, while their modelling and control are relatively difficult and complex. This paper proposes an improved hysteresis model of a notched continuum manipulator based on the classical Bouc–Wen model, which can reduce errors and increase the accuracy of the kinematic-mechanics coupled model. Then parameters are identified by the mean of genetic algorithm (GA). 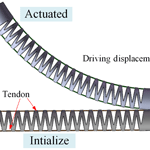 Hysteresis phenomenon of the mentioned manipulator is actually caused by many factors such as the hysteresis property of Hyperelastic Nitinol Alloy (HNA), the elastic deformation of tendon and the friction between the tendon and the tube. 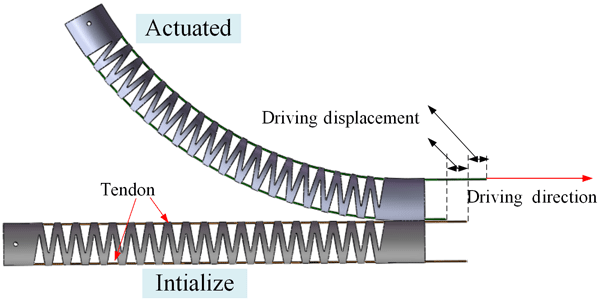 The results of both static and dynamic experiments show that the introduced hysteresis model can eliminate the positional difference between forward and reverse bending processes, and thus improve the forecast precision of deformation during motion. This model can also be used to compensate modelling errors caused by hysteresis of other similar systems. How to cite: Yu, H.-J., Yang, W.-L., Yang, Z.-X., Dong, W., Du, Z.-J., and Yan, Z.-Y. : Hysteresis analysis of a notched continuum manipulator driven by tendon, Mech. Sci., 9, 211-219, https://doi.org/10.5194/ms-9-211-2018, 2018.